With help from marine technician Nick Matthews (right) on the BIOS-SCOPE cruise offshore Bermuda in the summer of 2016, microbiologists Steve Giovanonni (left) and Jimmy Saw (middle) of the University of Oregon deployed a pump to sample microbial communities living far below the surface. Photo by Jorge Sanchez. 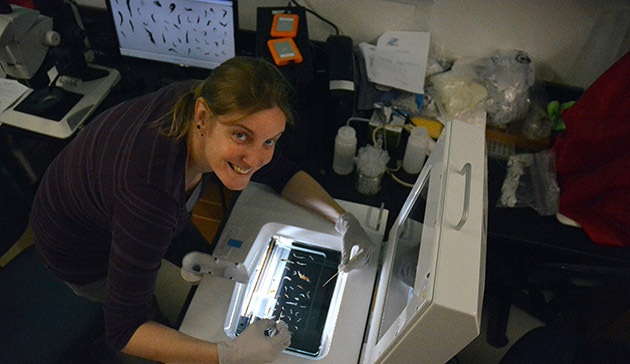 BIOS acquired three new instruments this spring to enrich investigations into the roles and interactions between microbial communities and migrating zooplankton in the Sargasso Sea. The instruments, which include a high-volume water pump, a unique net system, and a specialized animal scanner, will be used as part of a large, ongoing project called BIOS-SCOPE, for Bermuda Institute of Ocean Sciences Simons Collaboration on Ocean Processes and Ecology. BIOS-SCOPE’s team includes oceanographers, marine chemists, molecular biologists, and microbiologists from six research institutions who are working together to discover how plankton consume and produce organic matter throughout the year. Marine plankton are major drivers of chemical cycles in the ocean and even influence Earth’s climate due to their sheer abundance, rapid growth rates, and complex microscopic food webs where some species feast on and transform waste generated by other species. The high-volume pump increases the opportunities for BIOS-SCOPE microbiologists to sample large volumes of water from different ocean depths, concentrating the microbes and particles from hundreds to thousands of liters of water onto a large filter. Genetic material extracted from cells captured on the filter reveals the identities and activities of the microbes present. This sampling method is at the core of tracking how microbial communities boom and bust at the ocean’s surface, and at depth, impacting nutrient cycles in their wake. BIOS scientist Leocadio Blanco-Bercial (wearing blue hat) and marine technician Nick Matthews (in orange hat) prepare nine nets on the MOCNESS to sample zooplankton migrating up from deep waters to feed. By sampling night and day, the BIOS-SCOPE team learns how microbial communities respond to daily environmental changes, including changing nutrients released by zooplankton as they migrate up and down each day. Photo by Jorge Sanchez. 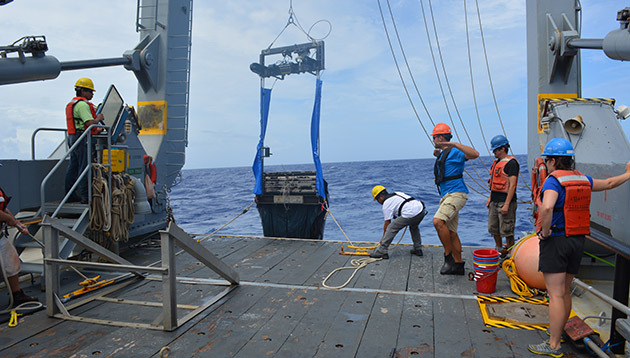 The second instrument, a new Multiple Opening/Closing Net and Environmental Sensing System, known as MOCNESS, expands the team’s ability to sample zooplankton at discrete depths, from well-lit surface waters down through the ocean’s “twilight zone,” where light steadily decreases into darkness. The MOCNESS has nine nets, each 30 feet (9 meters) in length. Each net can be opened and closed, one by one, as they are towed through the water across different depths. Sensors mounted on the instrument’s frame record the environmental characteristics and volume of water filtered through each net, providing vital context about the habitat of captured zooplankton. BIOS scientists (and BIOS-SCOPE team members) Amy Maas and Leocadio Blanco-Bercial called the new MOCNESS tow system “a completely critical tool” for research questions related to the diversity of zooplankton and their role in the ecosystem. Zooplankton are drifting animals and their diminutive sizes or soft bodies often constrain their ability to swim against the currents. But remarkably, a subset of these drifters, most smaller than a coin, and many even smaller than the edge of a coin, swim to depths of one-quarter to one-half-mile (400 to 800 meters) every day to evade fish and other hungry predators. These zooplankton spend daylight hours resting in deep, dark waters, and when the sun sets they swim back up to feast on freshly grown single-celled algae near the surface. This daily migration was first discovered by U.S. Navy sonar surveys during World War II. Deep aggregations of zooplankton were sometimes so dense that they were mistakenly identified as shallow seafloors. However, when that “seafloor” disappeared, scientists and sonar operators realized they were witnessing a biological phenomenon. Now, the BIOS-SCOPE team can rigorously investigate the consequences of this phenomenon on nutrient cycling in the Sargasso Sea, and tease apart how the daily and seasonal patterns of zooplankton abundance intersect with patterns in ocean chemistry and microbial abundance. In mid-April, Blanco-Bercial will head to sea to test the MOCNESS calibration and deployment protocols with the BIOS marine operations team. 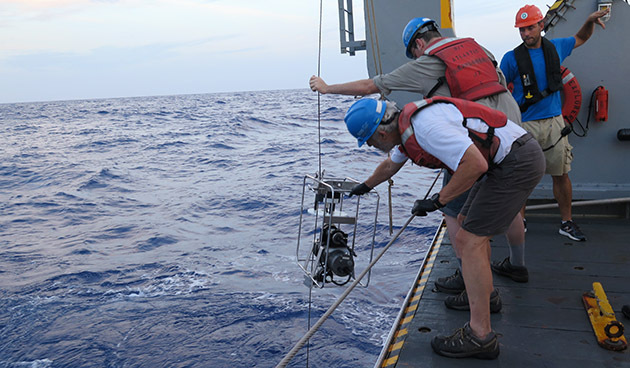 In July, the instrument will be deployed in conjunction with the full suite of BIOS-SCOPE physical, chemical, and microbial sampling methods to study the ecosystem’s summer functions. BIOS scientist Amy Maas loads the new ZooSCAN instrument to analyze zooplankton caught in one of the MOCNESS nets. The computer behind her shows the enlarged zooplankton images, the results of a high-resolution scan. The third new instrument, an automated imaging tool known as the ZooSCAN, speeds up identification of zooplankton within net tow samples. 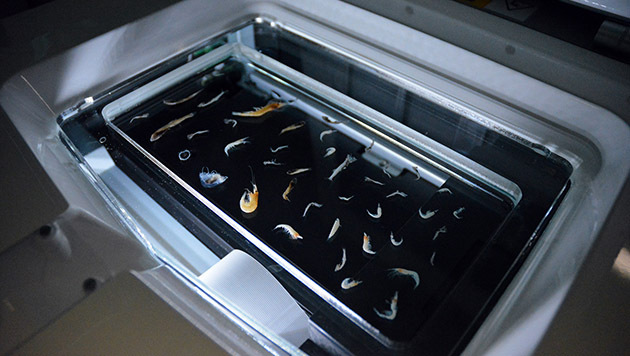 Rather than an expert spending hundreds of hours at the microscope sorting, identifying, and counting the plankton, preserved samples are simply poured into a waterproof, flatbed scanner. Within the high-resolution image generated from a sample, the ZooSCAN software recognizes individual animals, tallies the abundance of individuals within groups of interest, and calculates vital metrics on size and volume of individual animals. An online web repository hosts ZooSCAN images, making them available to research communities worldwide. The ZooSCAN is already running in Maas and Blanco-Bercial’s lab, where it is being used to analyze BIOS-SCOPE samples collected over the past year. For Blanco-Bercial, a molecular biologist who mines genetic data from plankton caught in the net, the scanner images provide an intriguing way to corroborate his genetic census of animals present in the sample. And while genetic information provides the gold standard for identification, it lacks information about the size or life stage of the organism it came from, which can be gained through the scanned images. For Maas, who investigates zooplankton physiology and resilience to environmental stressors, the scanner’s quantification of species and sizes helps refine estimates of metabolic processes, like respiration. This data will help clarify how zooplankton communities generate waste and modify water chemistry at different depths, which may influence the abundance and composition of microbial communities that drive chemical cycling. A scan from a MOCNESS sample revealed a deep sea caridean shrimp, a jellyfish from the family Periphyllidae, and a predatory Arietellus copepod. When not in use for BIOS-SCOPE, the instruments, provided through a supplemental grant from Simons Foundation International, are available to the BIOS research community. Already Maas and BIOS coral researchers are in the early stages of exploring how the scanner can be optimized to image coral larvae, which also begin their life as drifting plankton. “These instruments absolutely strengthen our scientific capacity here at BIOS,” Maas said.